Right now, I am staying in the Chicago area. Hello Chicago, it’s so mild and windy–we really wonder where winter disappeared, even in your city. 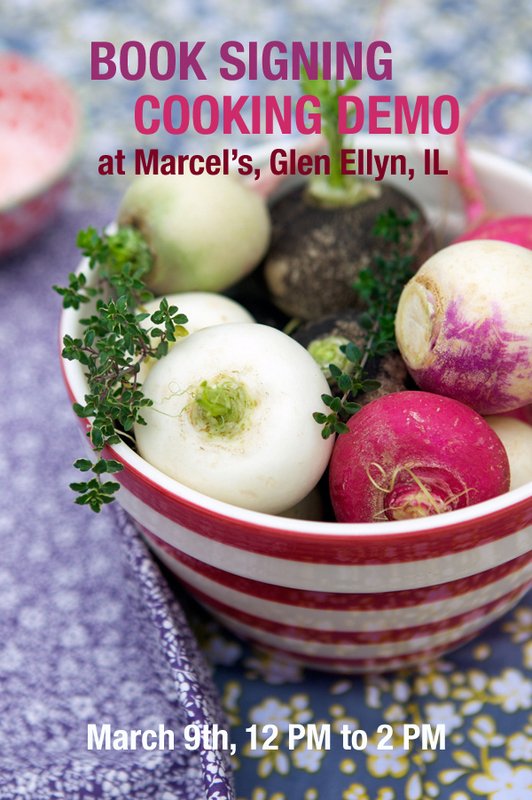 On March 9th, I will be at Marcel’s for a book signing and cooking demo, between 12 PM and 2 PM. Very much looking forward to it. If you live around, I hope you will be able to come and say hello. I’d love to meet you! Bea, you are moving west… a good sign for those of us in California! Is Southern California in your plans? Please let me know. Going to order the book today, unless I hear that you will be here: then I will wait and purchase it from the book store that hosts your signing. My dearest friend lives in Glen Ellyn, i will forward to her. I am envious, sigh. Have really been enjoying your new cookbook. Any chance your travels might some day bring you back to Oregon? I live in Eugene and I bet there would be a wonderful audience here for you and the new book…. Hi Pascale, thank you for your sweet note. I currently don’t have set plans to be in Southern CA, unfortunately. Hopefully at some point though. merci! Would love to be in OR. No current plans at the moment, but I will surely announce anything that comes up. Many thanks again! Very pleased to hear you like the book! Yeah! Portland, yes, a great culinary destination, as you know. Enjoy tomorrow! Just wanted to say how amazing I find it that reading your blog gives me this feeling every time – this feeling of warmth, happiness and home that I miss sometimes. Malheureusement sur un autre continent, je n’aurai pas l’occasion de venir! J’ai hâte d’avoir ton livre dans mes mains et je t’encourage pour tout ton travail toujours aussi apprécié par tant de monde! was looking for you to come to IN. Do you have your visits posted? I need to add more once they are confirmed, so I advise checking often. I also announce them on my blog once we get closer to the date. We are waiting for you in Portland, Oregon! Typical. You are signing your fabulous book in Chicago now that I have left and now live in London. I do hope you will consider making a side trip over to the UK when you plans next bring you to France. Please know you have fans here as well! Very nice post on the Traveler’s Lunchbox (/www.travelerslunchbox.com/) about you and your book! I love your blog! I’ve been searching for coffee cups that have those bright, tiny prints that you’ve got. Any help on where to find them? I would love to come to your book signing! I live in Evergreen Park! I am just now finding your blog…it is wonderful! I wish! Am on the opposite side of the globe! I’ve been meaning to gush to you about your book. It’s stunning. Everything about it feels so you and I don’t even know you. It’s clean, bright, gorgeous and nearly every recipe I’ve dog eared. Great job! I wish I am there. Your book is wonderfull! Its a first book over a long time, i cant but down!! Every recipes is great and appealing i will try them all! Bravo!! really great job!!! Have you tought publishing in france as well, it could sell well here!! I love your book. I wish you would come to Florida. J’adore les photos ainsi que les savoureuses recettes. Marie…I am in “Uhhh” & “ahhh” of your beautiful food blog. I love every inch of your page.You make me fall in love with food (especially dessert) and traveling again! !Merci beaucoup!! !